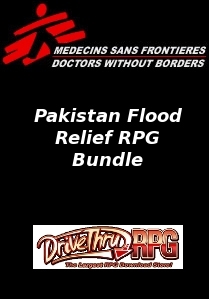 In a successor to February’s bundle for Haiti, this is a fundraiser for Pakistan flood relief. Simply incredible amount of game creativity for a tiny price – and all for a worthy cause. What’s not to love? Posted by morgue on Tuesday, October 19, 2010, at 10:02 am. Filed under And also. Tagged activism, role-playing games, self-promotion. Follow any responses to this post with its comments RSS feed. Both comments and trackbacks are currently closed. Heh… had been meaning to buy Icons anyway and this means I get Icons plus a bunch of other stuff… since when was doing good this easy?